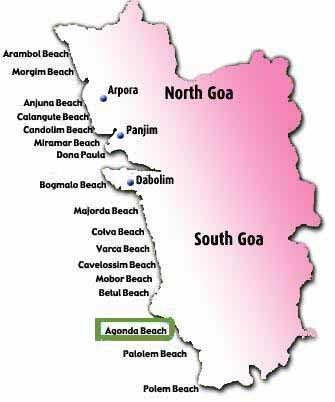 Agonda beach is a small beach located 37 kilometers away from Margao. It is located in the Southern part of Goa. The solitary and isolated beach of Goa attracts less number of tourists throughout the year. Only nature lovers come to this place to enjoy the serenity of the place. One will find a few fishermen and local boys playing on the beach. The beach does not see the tourist gatherings on it. The beach is covered with a mountain towards the south and the beach is fringed with many palm trees. The beauty of this beach is wonderful and it provides a great scenic beauty to the visitors. But due to the hill and the preservation of environment, the beach remains an isolated beach. The government as well as villagers is not allowing much of the crowd like any other beaches of Goa as this is saved as the breeding ground of Ridley turtles. Though one may not find many of the tasks in the beach, but sitting and watching the nature will engage one for a great time. Certain part of the beach is rocky and it gives beautiful view of the sea from the Rock. The bigger rocks and hillocks located near the beach gives some activity to the beach travelers as they get an activity to stay connected with the beach. Very few of the tourists visit who enjoy the ride to hillocks and sit in the isolated beaches. One can find a boat ride with the local fishermen to see the Dolphins. The rides can be bargained with the boatmen and can be fixed at an affordable price. People love to stay under the open air in night on this beach. Its calmness and serenity binds many to stay there for making a longer stay. Much tourist camps on the beach during the night hours to enjoy the conjecture of clear water, clean sky and white sand. The party lovers enjoy the night on the rocks and on the beach. Many prefer to stay throughout the night to enjoy the lonely nights and lonely meals on the beach. Only group of friends and couples love to spend their night on this beach. It is also a great place for nature retreat. It allows silent moments to the city dwellers. One can visit the Agonda beach as a rescue from the hustle and bustle of life. The city life does not follow anyone to this place. One can really enjoy the solitary moments on the beach. Another tourist attraction of the Agonda beach is the citadel known as Cabo de Rama. This citadel has mythological connections and it is believed the hero of epic Ramayana, Lord Rama stayed here during his exile. This citadel provides beautiful view of the sea. To reach Agonda Beach from Margao/Madgaon railway station, Canacona railways station or Chaudi, you can hire a taxi. The taxi rental will be around Rs 150. You can get bikes or scooters for local transportation. You can get local buses run from Chaudi to Agonda stopping at the T-junction near the church. A small walk of one and half kilometers by foot takes you to the Agonda beach. Accommodation in Agonda beach is never an issue for any travelers. The beach resorts are located near the beach. One can also find guest houses at an affordable price. A few days stay at the beach provides much of the opportunity to reveal the truth of nature. Though the beach does not remain much crowded during the day time, one can stay near the beach and spend the whole day on the beach or shades of the palm tree for relaxing oneself. It is a great resting place for the city dwellers.